Kongu Mangala Vazhthu, composed by Poet Kamban (who also known for his Kamba Ramayanam - the story of Rama in Tamil) vividly describes the marriage ceremonies and events of Kongu Vellala Gounder community. You will only find a folk poetry recited in Gounder weddings. The poetry is recited in praise of institution of Gounder wedding system which enhances the community to grow and prosper. Kongu Mangala Vazhthu in Tamil. Gounder caste is subdivided into 64 clan groups or Kongu Vellalar kootams . The totemic clan or Kootam (Kulam) names have links with their chieftains. Some of their kootam names like Attangarais (river bank), Malaiyadi (foot of the hills), Padaithalais (leaders of armies), Pavalamkatti (wearers of coral), Sendhalais (red-headed men), Tollakadu (ears with big holes), Vellikkai (the silver hands) etc, reminds us the Sangam period tribal group's naming traditions. The Gounder people marry outside their clan or kootam or kulam. 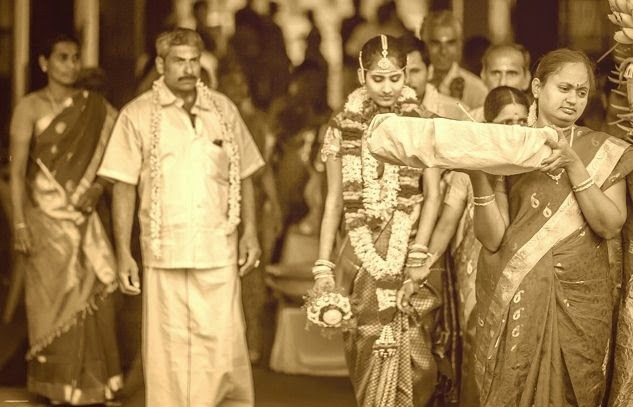 Their elaborate three-day marriage extravaganzas and marriage customs still followed meticulously in Kongu Vellalar community marriages speaks volumes about their sustenance of their traditions and culture. The respective village barber, dhobi, cobbler and the potter play prominent roles in Kongu Vellalar community marriages. Nal Virunthu - The First Day of the marriage celebration: On this specific day extravagant feast hosted by the bride’s and groom’s families for the bride and groom respectively. Bride's and Groom's Family Rituals - Second day of marriage celebration: Several arrangements and events takes place on this day. Relatives gather at bride's house and groom's house separately and the following rituals takes place: 1. Elders erect pandhal (the large open-sided temporary pavilion using bamboo and coconut mat); 2. Erect Pandhakaal (Muhurat Pole - a holy pole will be erected in the south-east corner to be forming part of wedding pavilion); 3. The barber (Naavidhan) performs a haircut and shaves the groom; dhobi (kudimagan) spreads the long Sarees on the floor; potter brings holy mud pots for some wedding rituals; 4. The marriage will be announced to the village community by the village drum beater; 5. The bride’s family as well as bridegroom’s family will be hosting of feast for their relatives in; 6. Bridegroom will be leaving for the bride's house. Marriage - Third day event: The Muhurtham will take place on third day. The Kongu Vellalar community marriages doesn’t follow any of the typical Vedic rites and there won't be any brahmana priest or sacred fire. The community elder of the village (known as Arumaikaarar) will conduct each and every rituals and rites of the marriage. Seer Koduthal (Handing clothes and jewelry) is another ritual. Arumaikaarar receives seer from bridegroom's family including all the clothes and jewels, in particular the Thaali (Holy thread tied around the bride’s neck to solemnize the wedding) of the bride along with some betel leaves and nuts and handover to the bride. He also uses the red boiled rice to ward off (drishti) evil gaze over the groom and bride and throws the rice towards the farming ways of the community. The bride and groom get ready for the marriage after the holy bath with clean water to signify cleansing and made to wear new clothes. 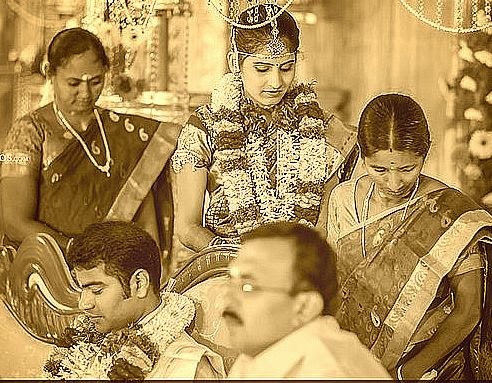 At the predetermined hour, the couple-to-be sit on the marriage platform, and the Thaali (already knotted, unlike other Hindu weddings where the groom ties the knot) is handed to the groom by the Arumaikaarar to be placed around the bride’s neck. The bride and the bridegroom will be seated on the marriage platform on completion of appropriate rites. The Thaali (Mangala naan) -already knotted - will be placed (not tied) by the bridegroom around the bride’s neck. Friends and relatives bless them with rice and flower petals. Now the couple is formally married after the wedding ceremony coming to an end. After feast the couple will be going to bridegroom's home to commence their married life. Now the village cobbler will handover a pair of chappals to bride and groom.